I’ve been meaning to talk about this book for awhile now. I read this book a few years ago, and it literally rocked my world. You see, sometimes I think I’m a left brained robot. I can calculate complex logic problems in two seconds. I always could. I remember being at a high school boyfriends house for a holiday with his whole family, and they were doing a thing with a deck of cards that was taking each of them forever. Some couldn’t do it at all. I made mistakes on purpose, I knew exactly what to do and was EMBARRASSED that I was going to look like a “know it all”. I was a girl, girls didn’t know this stuff better than boys! But I did. And I pretended I didn’t. But I’m also great at sales and marketing. I love the psychology of sales, and in my spare time, I was doing all this right brained stuff for fun. I’m a natural born geek, but I study dreams and chakras for fun. Talk about psychology! I am a living dichotomy, I have very balanced right and left brains. So back to the book. And why YOU should read it. 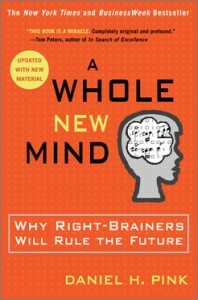 A few years ago, before Oprah had him on her show and promoted his book to the entire free world, I came across Daniel Pink and his book “A Whole New Mind – Why Right-Brainers will Rule the Future”. WOW! He was saying what I’ve known for years but couldn’t explain nearly as well. We live in a left-brained, “you must be a doctor or lawyer when you grow up” world, but life is different now. Consumers can now go to WebMd for medical advice, use TurboTax instead of an accountant, and Google every freaking legal matter known to man. If you want to be successful at a left-brained career, you need to be CREATIVE. YOU are creative. It’s 2013, and while it’s more acceptable for girls to be geeks and boys to be creative than it has in the past, you creatives still sometimes hide in the closet. The accountants, lawyers, and doctors of the world NEED you, need you to add some creativity to their businesses! They’re starting to know it, you’re seeing more and more mainstream media talk about intuition, about connecting emotionally with clients. Your yoga studio is filling up with left-brained executives, people who would NEVER have thought they would be in a yoga class 10 years ago. Professional football players are talking about meditation. I heard a guy in an elevator the other day talking about his throat chakra! It’s a whole new world, and the right-brained creatives are ruling it! Daniel Pink tells a lot of stories in this book. He talks about how an MFA, Master of Fine Arts, is becoming more valuable to businesses than an MBA. He talks about how it’s harder to get into UCLA’s Fine Arts Graduate School than it is to get into Harvard Business School. How crazy is that? Are you surprised? I’m not! Read this book! It might just be the validation you need to realize that YOU, the right-brained, creative entrepreneur, are ruling the world. Don’t you just LOVE that? I know I do. I love this book! Being a lefty, I live in my right brain. This book gave me hope and encouragement to go off and start in the biz world again.